If you’re like me, it has been a frequent fantasy every time the event comes around, only the kind of money necessary to fulfilling those guilty desires has somehow eluded me, despite my most ardent efforts. That fact does little to change the reality of how it would feel to attend the famous auction featuring everything from the cars you wished were yours in high school to the hardest to find most exotic and desirable vehicles in the world. That'd where John Hendricks found the Oldsmobile 88 that proudly revolves under the Hollywood style spotlights in his Gateway Auto Museum in Colorado. The founder of the Discovery Channel spent 2.8 million dollars to buy the concept car that was Oldsmobile’s answer to the Corvette in 1964. Only six were ever built and only three remain in the world – two of which reside in private collections beyond the view of the public. Remarkably, almost all the cars in the Gateway Museum are still road worthy and a few of them make it out for a drive every year at an annual event. Hendricks has the ways and means to indulge his every fantasy. So if you had a million bucks and were at the Arizona auction, what would you bring home? It’s different for all of us, depending on what we found cool as a youth and the models that eluded us, as we grew older and more practical or developed new and different priorities. Incidentally, the car pictured here is not available at the auction, but for me is a perfect illustration of the dreams a car enthusiast might well encounter there. 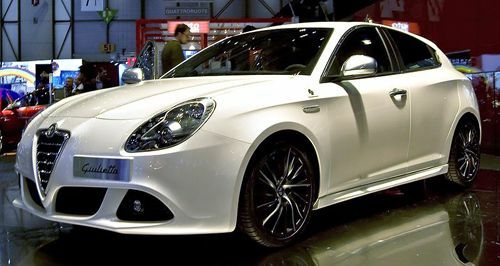 It is a 2010 Alfa-Romeo Giulietta photographed in Italy by David Villarreal Fernández. Or perhaps you’d go for the last year of the big Mustangs with a 1973 Ford Mustang convertible in Wimbledon White with a new top and a thick folder of receipts documenting its ownership history. (Lot 52.1) Plus the 351 cubic inch V8 chock full of ponies rearing to run in the open air, of course – awesome! Whichever way your taste might wander, there something for you in Scottsdale – whether its classic antiques from 1910 to1940, luxury sports cars from 1950 and beyond or pickups old and new, classics of the early four-wheel era like Jeepsters, Salon cars across the years or late model supercars – there is something for every taste at Barrett-Jackson. The only sad aspect of the whole affair is there is not a thing for the man with less than fortunate means – but such is life and all things change in their time. So undaunted by the fact there’s no million to spend on long held dreams in 2013, there is always next year. Perhaps I will see you there yet and bid against you for an exquisite 1958 Alfa Romeo Milano S.
That’s the car I fell in love with at the tender age of 14 and the image haunts me still. A million bucks at a B&J auction and I would hunt down a Maserati A6GS, an Alfa Romeo GTA (my birth year) and probably something else for fun. Unfortunately, none of the Bugattis, Alfa Romeo 2900 could be had for that lump sum anymore. So are we a generation too late or a generation early for the next big thing? In the meantime, I find solace with my 1974 Spider and impeccable 89 Milano. Not only is driving such a car a sheer pleasure unto itself, but it is an ersatz time machine that briefly can return you to a bygone era of uncrowded highways, cheap gasoline and open roads aplenty. Saw a couple guys at a station last summer putting petrol into a 30's era Bugatti - once fueled they had to push it to get it started but once it did the tenor and tone of that engine was well worth the effort. A high-performance internal combustion engine running at peak efficiency creates a symphony of mechanical perfection, a street level compliment to the works of Bach, Beethoven or Strauss. Cars back then were a form of unbridled freedom, a sensory immersion equaled today only by the experience you can get in an ultralight plane. That's why I believe even after we all drive electric cars on a daily basis. there will still be places where you can go and experience the sensory overload of an internal combustion engine at full tilt. And by the way, you should have seen that 58 Milano S and the gorgeous young rich girl driving it in 1965.